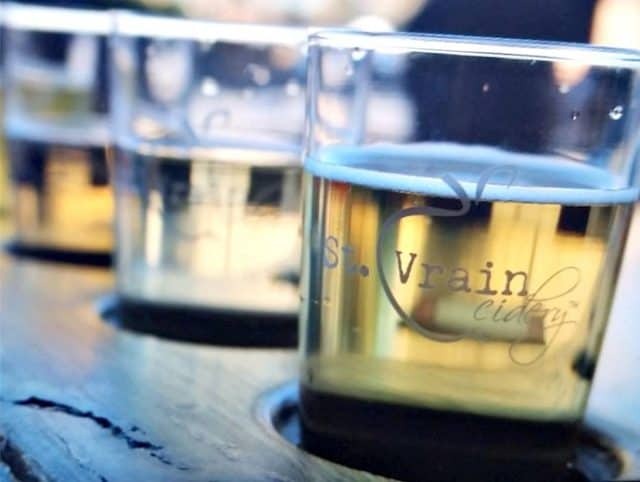 Longmont, Colorado’s first cidery, St. Vrain Cidery, opened up to the public last year and since that time has been offering an extensive array of cider offerings along with an exciting event calendar, all at its Terry Street location. “We are excited to bring craft cider from all over the state of Colorado to the bustling town of Longmont,” states Lis Geraci, operations manager. St. Vrain Cidery currently offers 24 taps of a wide array of ciders, such as the trademark hard apple cider and peach cider, and anticipates adding 12 more taps this summer. Guests may also enjoy flights of cider to sip and sample. “We specialize in dry-styled ciders. We strive to let the cider apple’s characteristics shine through by not filtering and using cider apples we source from Western Colorado,” offers production manager Cyn Goodman. St. Vrain also invites musicians to provide live entertainment, featured food truck vendors, yoga and cider and even culinary pairing events, such as a cheese and cider pairing (featuring baby goats!) on June 26. Learn more about this cider hot spot and future events by visiting St. Vrain Cidery’s website and Facebook page. Find St. Vrain Cidery at 350 Terry St., Ste. 130, in Longmont, CO; phone: (303) 258-6910.